Candles are a symbol of Imbolc, which is also known as Candlemas. With some advance planning, you could make your own this year. You simply cut the sheet as wide as you want the height of the candle to be. A straight edge and a craft knife work well, but other items in your kitchen will also suffice. Cut the wick about an inch longer than the wax. With a blow dryer, warm up one end of the sheet. Place the wick close to the edge and carefully fold the end of the wax over it and press it down. Warm the whole sheet, which will make it easier to roll the candle. (Candles can be made without the blow dryer as long as you are not working in cold conditions.) Carefully roll up the candle as tightly as possible, checking to make sure the edges are straight. Gently press the end of the sheet into the candle to seal it. Clip the wick to about 1/4 inch before lighting. Concentrate on your intent while making your candles, perhaps chanting or first casting a circle. Dried herbs or scented oils can be sprinkled onto the wax before rolling. 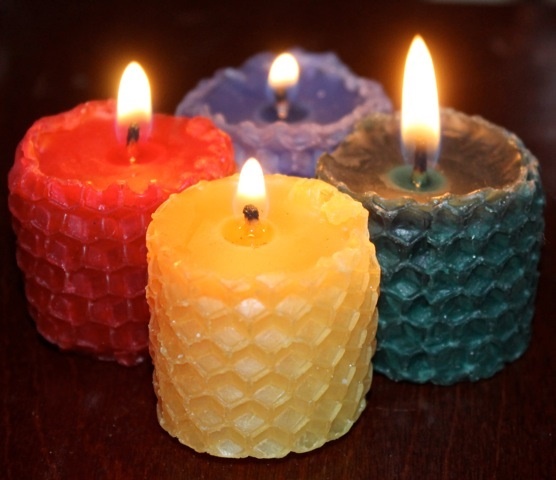 With no previous experience, my first time I made several sets of votive-sized candles in the four directional colors that have served me well. I find it meaningful when the candles on my altar are ones that I’ve made. Other candles that might interest you can be made by melting wax and pouring it into a mold or container. Pre-made candles can be customized by dipping them in wax to which oils, colors, herbs and crystals have been added. A word of caution: wax is extremely flammable.